It is with great sadness that I share the news of the death of Connie Curran, EdD, RN, FAAN, Editor Emerita of Nursing Economic$. INANE colleague Donna Nickitas told me that Connie was a 17 year survivor of cancer; she was just recently diagnosed with stage IV cancer which caused her death. Donna had planned to see Connie at the American Academy of Nursing meeting last month, which tells us how quick this was. “She was a wonderful friend, colleague and mentor and will be sorely missed. 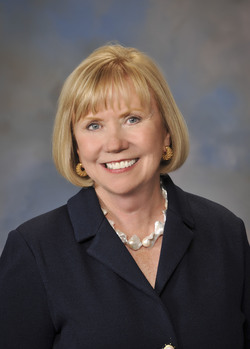 Connie’s leadership, political acumen and how to manage the corner office taught us how to use our influence, power, and poise to position nursing’s contribution to society.” writes Donna Nickitas, Editor of Nursing Ecomonic$. “It is with great sadness that I write to inform you that our great friend, Trustee Connie Curran, who passed away this morning after a long battle with cancer. Please keep her family in your prayers as they mourn their tremendous loss. A leader and caregiver, Connie offered encouragement and kindness to everyone who crossed her path. Having earned her master’s in nursing from DePaul, she was an outstanding alumna and supporter of our university. A member of the Board of Trustees since 2007 and a Member of the Corporation since 2009, she had recently agreed to serve as the chair of the Philanthropy Committee, a role that speaks volumes of her dedication to our university. She also served as the chair of the Mission Committee. Connie never stopped motivating others to support DePaul and was an energetic advocate for our science and health programs in particular. Her personal generosity helped support the construction of the Msgr. Andrew J. McGowan Building. She also was a tireless fundraiser for DePaul and actively volunteered during the Many Dreams, One Mission campaign. With roots as an inner-city nurse, Connie served as chief nursing officer of Montefiore Medical Center in the Bronx, vice president of the American Hospital Association and dean at the Medical College of Wisconsin. She became a national voice for health care and advocated tirelessly for nurses to have a seat at the table for governing boards of hospitals and health care organizations. Having experienced the complexities of the health care system, she knew firsthand how nurses serve as navigators for their patients and represent their voice at the table. She argued good patient outcomes depend on having nurses in the boardroom, because they are closest to the customer. As a national health care expert, Connie shared her insight with audiences across the country by appearing on such talk shows as Good Morning America and Nightline. She authored four books, most recently “Claiming the Corner Office: Executive Leadership Lessons for Nurses,” with her colleague and fellow nurse, Therese Fitzpatrick, a member of the advisory board for our College of Science and Health. In addition to serving on DePaul’s board, she was the chairman of the Board of Directors for DeVry, Inc. and was active on the boards of Hospira, Inc., Lurie Chicago Children’s Hospital and the University of Wisconsin Foundation. She was executive director of C-Change, an advocacy organization based in Washington, D.C. dedicated to the eradication of cancer. At C-Change, she worked closely with former President George H.W. Bush and former First Lady Barbara Bush, the founding honorary co-chairs of the organization, and Senator Dianne Feinstein, the founding honorary vice-chair. In 2006, she founded her own independent health care consulting firm, CurranCare. She founded and served as CEO of Best on Board, a national organization focused on educating and certifying health care trustees, from 2010 until the time of her death. Another memorial comes from Kathleen Corbett Freimuth, Editor of Nursing Dimensions, the University of Wisconsin–Madison School of Nursing quarterly e-newsletter. “The University of Wisconsin–Madison School of Nursing is profoundly saddened to lose an alumna, dear friend, and supporter. Curran, a 1969 graduate of the School of Nursing’s baccalaureate program, was a stalwart supporter of the school in its pursuit of the dream to build Signe Skott Cooper Hall. Curran’s gift to support the construction of Cooper Hall and to endow a fund to support nursing student organizations merited the school’s naming of Curran Commons, Cooper Hall’s first-floor student lounge. Attending the University of Wisconsin–Madison School of Nursing set Curran’s trajectory to become a respected health care scholar, entrepreneur, and nursing advocate. Attaining an MBA from Harvard Business School and a doctorate in education (EdD) from Northern Illinois University, Curran rose to prominence in health care executive leadership. She was co-founder and CEO of Best on Board, a Chicago-based national organization focuses on educating and certifying health care trustees and assisting hospitals and health systems with board and governance issues. Additionally, she sat on numerous hospital governing boards in the Chicago area and on organizational boards, including the University of Wisconsin Foundation Board of Directors. The community of INANE offers our sincerest condolences to Connie’s family and friends…..and keeps them in our prayers and thoughts. This entry was posted in Announcements, In Memoriam and tagged Nursing Economic$ by Leslie. Bookmark the permalink.